"A Fine Art Print Makes Art Affordable"
All my prints are produced by the Giclée method. For those of you unfamiliar with this, a Giclée is a printing reproduction technique providing the highest quality and state-of-the-art, "copying" process used in the world of fine art reproduction. The resulting sample, whether executed on paper or canvas, could well be mistaken for the original, since the process produces exceptionally fine quality prints, with superb color accuracy. Artwork is produced by high-resolution digital camera scans then printed from large ink-jet printers using fade-resistant, pigment-based archival spray-on inks, which can stay true to color for 35 years or more out of direct sunlight. All of my prints are produced by this method using the Epson Ultrachrome K3 inks scanned on a TTI Digital Copystand with a Betterlight 8000 Digital Scanning Back. This system is capable of producing incredibly detailed prints at dimensions measurably larger than the size of the original artwork. Each print will be accompanied by a Certificate of Authenticity signed by me, the Artist. The law of various states, including California and New York, provides for the disclosure in writing of certain information concerning prints, photographs, and sculpture casts. 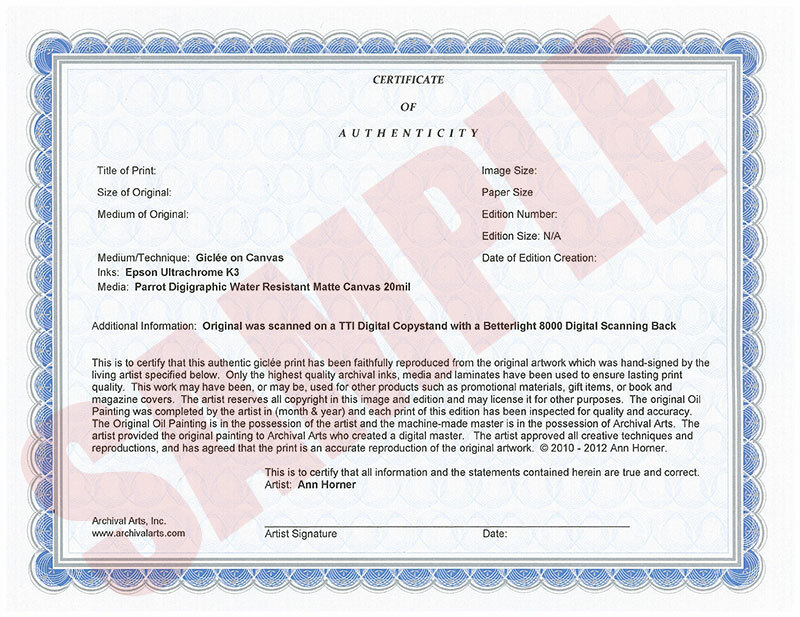 This information is available to you, and you may request to see it prior to the purchase, or link here (view attachment) to review a sample Certificate of Authenticity which describes the types of information you will be provided with any purchased print. Prices of prints will vary according to size, and since there can be so many sizes, please contact me via e-mail (see Contact page) with an approximate size for a free estimate (no obligation to buy). As an example, an 11" x 14" print would be about $150.00. Please note that all prints, whatever size, will be produced as the image size, unframed, on 20mil water resistant canvas with a 2-inch or 3" white border surrounding the print on all four sides for framing options. For framing, here are 3 possible suggestions: 1) The print is stretched over a wooden stretcher frame, and then formally framed. 2) The print is put on a stretcher frame about 1"–½" smaller than the image on all 4 sides so that it can be "gallery wrapped" – that is, the painting appears on all four sides of the frame, so no formal frame is required. 3). The white canvas border gets trimmed down to about ¼" then placed on a wooden board, and then formally framed. Mailing: All prints will be sent in a tube, via the US postal service. Shipping and handling costs extra, plus a 6% MD sales tax where applicable. Payment is made through PayPal. (You do not have to have your own account with them to make a payment). (All sales are final).